At the annual holiday open house at the Belger Crane Yard, you might not find a partridge in a tree, but maybe a ceramic pig. The traditional art-opening weekend meets the traditional gift-giving season at the following shows and sales, which involve multiple Kansas City artists. Artists in their studios sell handcrafted pottery, jewelry, sculpture and ornaments as part of the Kansas City Clay Guild’s Annual Pottery Tour. Friday, Dec. 4, 6-9 p.m.; Saturday, Dec. 5, 10 a.m.-4 p.m.; Sunday, Dec. 6, 10 a.m.-4 p.m.
Hello Art is featuring more than 40 artists, such as Vanessa Lacy, in its holiday show and sale. This free event puts work by more than 40 artists, most of it priced less than $100, on multiple levels of the hotel, along with live music by Alyssa Murray, Jessica Paige, Vi Tran, Victor & Penny, The Snow Globes and others and complimentary mimosas, Bloody Marys, coffee, hot chocolate, and a cash bar. The hotel's artist in residence, Megan Gallant, will also be on hand. 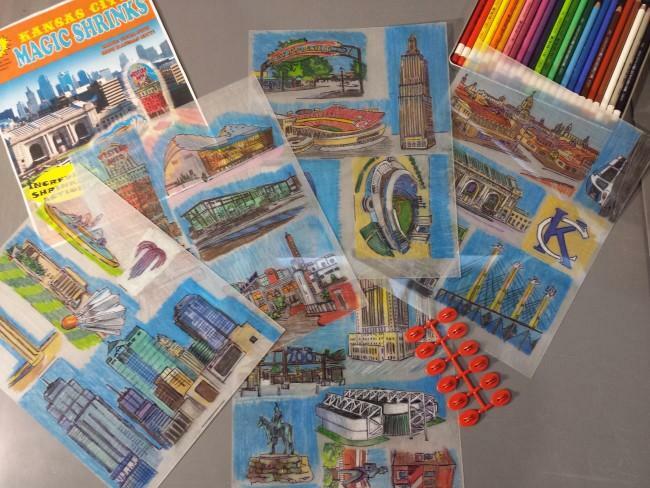 Sunday, Dec. 6, 10 a.m.-5 p.m.
'Kansas City Magic Shrinks' by Michael Schliefke are among the items for sale at the Holiday Art Market in the River Market. “This show is an attempt to bring more art into the River Market neighborhood," says curator and artist Michael Schliefke, who promises work from 20 artists – paintings, photographs, ceramics, jewelry, furniture and locally crafted creative holiday gifts. Opening reception: Sunday, Dec. 6, 1 p.m.-8 p.m.; Monday, Dec. 7, and Tuesday, Dec. 8, 11 a.m.-8 p.m.
People start to line up early, especially outside the ceramics building, at the end of each semester when Art Institute students display and sell their works across the campus. Bargains abound, as well as chances to meet up-and-comers who just might stay and make a living in Kansas City. Friday, Dec. 4, 5-8 p.m.; Saturday, Dec. 5, 10 a.m.-5 p.m.; Sunday, Dec. 6, noon-5 p.m.
Allan Winkler is one of the artists with works on display at Amy Meya's open studio and sale. Ceramic artist Amy Meya opens her studio to the public for this annual sale. Look for "brand spanking new" works from Meya and her cadre of artists: Desiree Warren's vintage recycled clocks, Laura Nugent's colorful lined paintings and flat file prints, and whimsical cut-outs from Allan Winkler. Plus, there will "eating and sipping." Friday, Dec. 4, 5 p.m. - 9 p.m., Saturday, Dec. 5, 10 a.m. - 6 p.m., and Sunday, Dec. 6, 11 a.m. - 4 p.m. In 2014, Buzzfeed listed Strawberry Swing as one of the "35 Indie Craft Fairs Every Creative Person Needs To Visit." This event, "full of creatives who are experts at their craft," includes more than 75 vendors, as well as food, drinks, music, and a photo booth. A portion of the vendor fees will be donated to The Family Conservancy and Great Plains SPCA. Saturday, Dec. 5, 10 a.m.-8 p.m., Sunday, Dec. 6, 11 a.m.-6 p.m.
Telephonebooth got its scrappy start in the mid-1990s, in the hallway of a Crossroads building owned by Jim Leedy. This tiny gallery relocated in 2002 to a former hair salon at 33rd and Troost. The December Market offers artwork from its roster of emerging and professional artists, framed and unframed, as well as "accessories of note." As an added bonus, writes artist and gallerist Tim Brown, "there will be hot tea and electric lighting." Dec. 3 - 19, Thursdays through Saturdays, noon-6 p.m. It just wouldn't be Hanukkah without the oil. 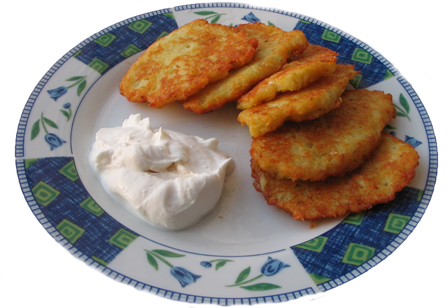 Latkes, jelly doughnuts and other foods for the holiday are drenched in the stuff to honor the miracle of the oil lamp in the Hanukkah story.